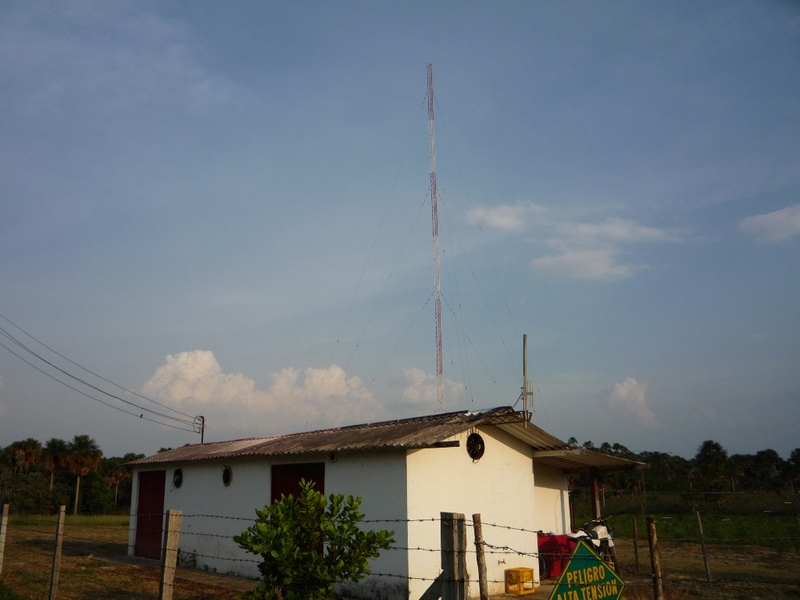 Alcaravan Radio’s antenna site and transmitter house. 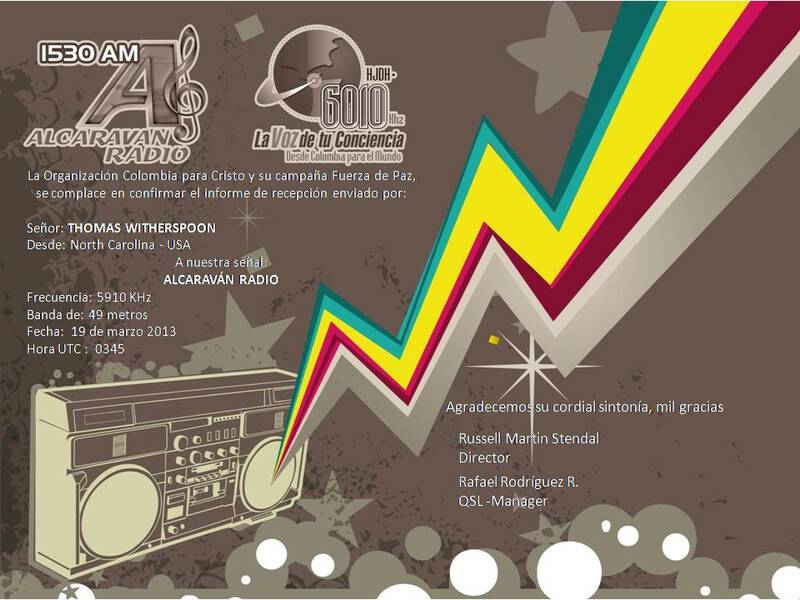 Yesterday, August 8, I was able to record Alcaravan Radio out of Puerto Lleras, Columbia. Alcaravan Radio broadcasts domestically on medium wave and also on 5.91 MHZ shortwave, from 23:30-12:00 UTC. Though typical summer conditions meant for a higher noise levels, Alcaravan’s 1 kW signal still punched through the static and made for pleasant listening. In this recording, I was using the WinRadio Excalibur, but I listened for a couple of hours on the Elad FDM-S2 as well–both did an equally good job while connected to my large sky loop antenna. To be clear, 1 kW is low output power by international broadcasting standards. Alcaravan Radio was not audible on the Tecsun PL-660 nor the Sony ICF-SW7600GR, though I have heard them on portables in the past during the late fall and winter months. Still, you might be able to snag them on a portable when summer conditions are favorable! Click here to view an Alcaravan Radio QSL and transmitter site images. 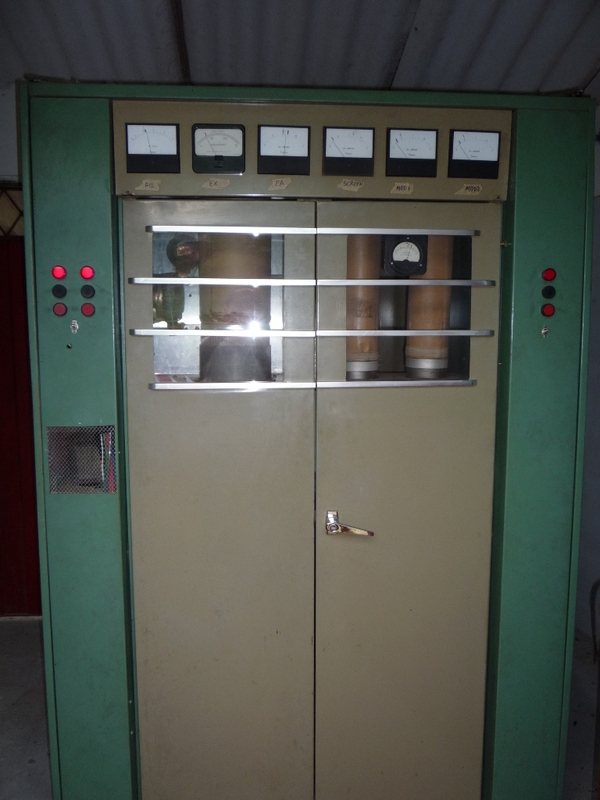 This entry was posted in Broadcasters, International Broadcasting, Music, News, Recordings, Shortwave Radio, What's On Shortwave and tagged Alcaravan Radio, Alcaravan Radio QSL, Alcaravan Radio Transmitter Site, Podcast, Recordings on August 9, 2014 by Thomas. After posting this recording of Alcaravan Radio a few weeks ago, I sent in a reception report to the station–within a day, I received this QSL along with photos of the station’s transmitter and antenna site (see below). Many thanks to Alcaravan’s QSL manager, Rafael Rodríguez R., for the prompt response! These would have been posted sooner, Rafael, but I’m only now catching up after some extended travel. Enjoy! This entry was posted in Broadcasters, QSL Gallery and tagged Alcaravan Radio, Alcaravan Radio QSL, Alcaravan Radio Transmitter Site, QSL, QSL Card, Rafael Rodríguez R. on April 16, 2013 by Thomas.